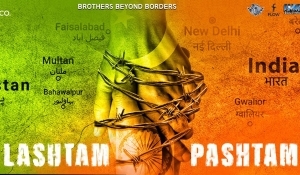 Anything for my brother – that’s the one line meaning of Lashtam Pashtam. And that is the emotion that binds our two boys Sid Oberoi (Samar Vermani) and Vibhav Roy (Fahd Khan) from India and Pakistan respectively. Their story begins at a Dubai tennis court as doubles partners. However, the untimely demise of Fahd’s father pushes him back to Pakistan. Fahd returns to Dubai when he grows up to live his father’s dream of winning the championship with Samar.